MarineMax reports it has expanded its relationship with CGI Finance by securing a new $30 million inventory financing facility for Azimut products. Previously, MarineMax&apos;s relationship with CGI was focused on the retail financing of boats. The new facility provides for as much as $30 million in floorplan financing, in addition to the $100 million inventory financing facility the company secured in June with a different lender. "The terms of the facility serve our needs and allow us to operate our business with the flexibility required in this environment," Michael McLamb, MarineMax executive vice president, CFO and secretary, says in a statement. "We also believe that by expanding our relationship with an international bank, we will be better positioned to serve the needs of our growing list of international buyers." The facility has a one-year term, and includes renewal options, subject to CGI&apos;s approval, and each advance under the facility can remain outstanding for 18 months. Interest accrues at the London Interbank Offered Rate, plus 350 basis points. In other news, MarineMax says it expanded its storage and service capabilities in Ohio with the acquisition of a large heated storage and yacht service facility. Terms were not disclosed. The marina and service facility, known as The Yacht Center, is in West Harbor, with deepwater access to Lake Erie and the islands near Port Clinton, Ohio. With 80,000 square feet of storage buildings and a 70-ton lift, the facility can accommodate vessels to 75 feet. MarineMax had occupied the facility as a tenant for a number of years before completing the acquisition. Jim Meyer, president and CEO of Hatteras and Cabo yachts, says the two boat brands will be produced in smaller quantities going forward but will be manufactured more efficiently. In an interview with local media in North Carolina, Meyer said the Cabo plant in California is expected to close by the end of the year and that both Brunswick lines will be manufactured at the plant in New Bern, N.C. Meyer expects that the change will create a "very, very full factory" at the plant as the market returns, although he does not expect a return to peak levels. In better economic times, he says, the company produced as many as 75 Hatteras yachts and 125 Cabo yachts a year. Going forward, he says, the New Bern plant will manufacture about 50 Hatteras yachts and 100 on the Cabo side per year. A local company that rents industrial equipment recently purchased the former Bayliner boatbuilding plant in western Maryland from Brunswick for $1.3 million. Wade Rentals bought the estimated 144,000-square-foot building on a 25-acre lot, according to Henry Hanna of Sperry Van Ness-Miller Commercial Real Estate. Local economic development leaders had looked to the alternative energy manufacturer AC-Wind to lease the property. The company announced plans to manufacture alternative-energy components at the location and create 700 jobs. The project was seen as offsetting nearly 200 jobs that left Salisbury when Brunswick closed the boatbuilding plant, moving the division in 2008 to Brunswick County, N.C., where it had a similar operation. Production of Pro-Line and Donzi boats may be moving from Florida to Fountain Powerboats&apos; facilities in Washington, N.C., although officials at American Marine Holdings, which owns both boat lines, stressed that no final decisions have been made. "[We&apos;re] still delving into the possibilities, looking at our options. We&apos;re in discussions with the economic development people in both Florida and North Carolina, but that&apos;s as far as the decision has been made thus far," John E. Walker, president of American Marine Holdings, told Soundings Trade Only in early October. "While the final decision hasn&apos;t been made, right now the lead horse in the race, if you will, would be Fountain since it&apos;s a more modern facility and it&apos;s right on the water and we are looking at manufacturing all of our products in one facility, but the decision has not yet been made," Walker says, adding that he has spoken with employees and explained the situation. He expects that a decision will be made by the end of the year. Australia-based sailboat hardware manufacturer Ronstan International acquired Frederik Andersen Maskinfabrik, the Danish manufacturer best known for Andersen winches. "Andersen winches are the perfect complement to Ronstan deck hardware," Ronstan managing director Alistair Murray says in a statement. "The company&apos;s experience in winch design and manufacture are a natural extension to Ronstan&apos;s expertise in hardware, and we look forward to the broader possibilities that we can offer to our customers with the combined product range." In addition to its manufacturing activities in Australia, Ronstan has been producing sailboat hardware in Denmark since it acquired Frederiksen Boat Fittings in 2001. Thomas Meyer, central manager of Ronstan Denmark Aps, takes over management responsibility for all Danish operations. All Ronstan Denmark and Andersen employees will continue in their current roles, the company says. Metal Shark says it is back in the recreational market with its 35-foot deep-vee Courageous. Built on parent company Gravois Aluminum Boats&apos; underpinnings, the 35 Courageous represents Metal Shark&apos;s return to its recreational roots. "Courageous is the ideal platform for buyers seeking unparalleled performance and rugged durability and offers an innovative alternative to fiberglass," Metal Shark president Chris Allard says in a statement. "Gravois has built high-quality recreational boats for the past 30 years, and Courageous is Metal Shark&apos;s evolution of that fabled bloodline." 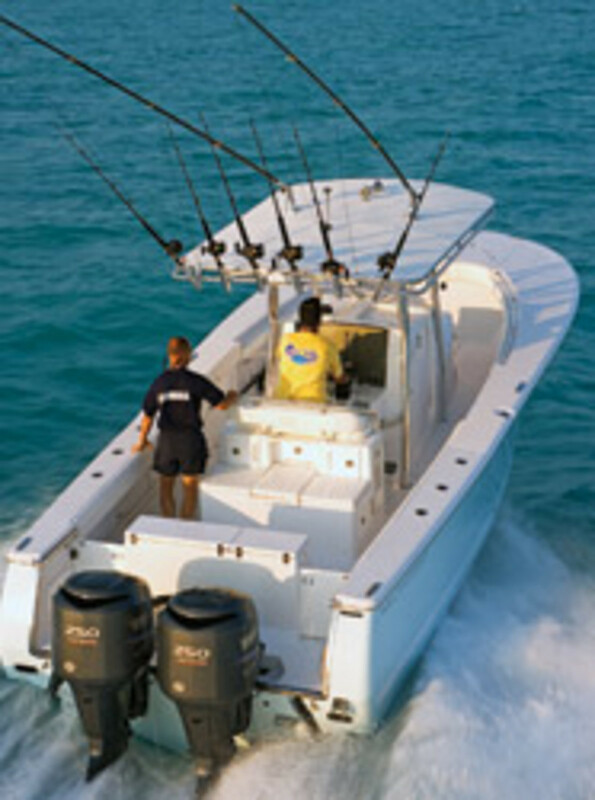 A subsidiary of Gravois Aluminum Boats LLC, Metal Shark specializes in boats for military and commercial uses. Employees at Sea Ray&apos;s plants in Knoxville and Vonore, Tenn., were told in September that the company is extending its normal end-of-the-year furlough at those facilities, according to Brunswick spokesman Dan Kubera. Production furloughs typically are taken near Thanksgiving and at the end of the year. The Knoxville plant began its furlough Oct. 4; the Tellico plant in Vonore was to begin its furlough in November. Both plants are scheduled to resume production Jan. 4, 2011. During this period, work to integrate new models and brands into production cycles will continue at these locations, Kubera says. Employees at Sea Ray&apos;s Palm Coast, Fla., manufacturing plant were told Sept. 20 that slightly more than 100 people, mostly temporary employees, will be laid off, Kubera says. Of the people losing their jobs, 75 were temporary employees, he says. Palm Coast&apos;s total employment, including temporary workers, was approximately 460 at the end of August. Additionally, the Palm Coast plant has added one week to its previously scheduled end-of-the-year holiday production shutdown, Kubera says. "As with the recently announced extended production furloughs [at Sea Ray&apos;s Tennessee plants], we take these actions to help us continue to closely manage the pipeline and help safeguard the health of our dealer network, particularly in light of the sluggish economy and retail boat sales, which have trended down recently," Kubera says. Wells Fargo Securities senior analyst Timothy Conder backed Brunswick&apos;s decision to extend the furlough at two Sea Ray plants in Tennessee as "prudent" and "consistent with our prior comments that new fiberglass retail boat sales, in general - and mid/larger boats, in particular - remain weak." "We will continue to monitor retail boat sales as we enter the U.S. off-season, but feel ... absent dramatic ongoing year/year declines, it will be [March 2011] before we again get a good read on retail," Conder wrote. "The general exhaustion of non-current new and quality used industry product should begin shifting the 84 percent used/16 percent new mix back toward historical levels of 75 percent/25 percent in 2011, benefiting manufacturers." In other news, Lund Boat Co., a Brunswick brand, recently brought its Crestliner plant to New York Mills, Minn. The move from Little Falls, Minn., could create jobs in New York Mills after layoffs in recent years. About 180 positions at the Little Falls plant will be affected, Kubera says, adding that about half of the positions might be transferred to New York Mills. The fate of three boatbuilders - a U.S. center console manufacturer, an Australian convertible builder and a venerable U.S. bass-boat builder from the 1950s - was in question as the summer season ended. Southport Boats suspended operations pending a sale of the company&apos;s assets by American Global Yacht Group, which bought Southport&apos;s assets in June. Operations were suspended in early September, says Frank Longino, Southport&apos;s former CEO. About 15 employees will be affected by the suspension, he says. AGYG&apos;s original strategic plan to purchase and manufacture Southport boats, as well as other brands, and market those brands through AGYG boat and yacht sales locations was tabled when AGYG exited the boat sales and brokerage business and closed all of its locations, according to a company statement. The Southport Boats sale includes all assets of the company, the trade name and records and can be completed with or without the lease on Southport&apos;s 52,000-square-foot facility in Leland, N.C.
Riviera Marine (Int.) Pty Ltd., part of a group of Australian companies that manufacture and sell luxury boats, is seeking bankruptcy protection in the United States. Riviera CEO John Anderson says in a statement that the filing is not a new proceeding but "merely a request that the U.S. courts recognize the [Deed of Company Arrangement] process, which was officially completed by Riviera in June 2010 and that allows us to complete our restructure of both our Australian and U.S. operations." Riviera Marine says it sold 52 boats, with sales totaling $54 million, for the fiscal year that ended June 30, down from 139 boats, with sales totaling $131 million, in 2009, and 327 boats, with sales totaling $265 million, in 2008. An absolute auction of Duracraft Marine assets was scheduled for Oct. 16 in Lexington, S.C. Duracraft owner Steve Deese announced earlier this year his plans to sell Duracraft and concentrate on his other business, Encore Boat Builders, the manufacturer of Bentley pontoons. The Duracraft logo and name were to be sold at the start of the auction. Items for sale included boats, equipment, trucks, trailers and forklifts. "The Duracraft name has been around since the 1950s and has a well-known name and excellent reputation of quality and value and has thousands of boats in the market today," says Deese. Deese owned Duracraft from 2002-08, when he sold it because of health reasons. However, the party that bought Duracraft was unable to keep it running in a poor economy. Deese acquired it from creditors in 2009. Atlantic event to date, organizers say. More than 2,100 attendees and nearly 100 in-water and land exhibitors participated in the three-day event, which was held Sept. 24-26 at Baltimore&apos;s Inner Harbor Marine Center. PassageMaker University, a two-day event offering in-depth educational courses, preceded the show. Trawler Fest organizers say attendance was up more than 20 percent from last year, when the event was held in Solomons, Md. 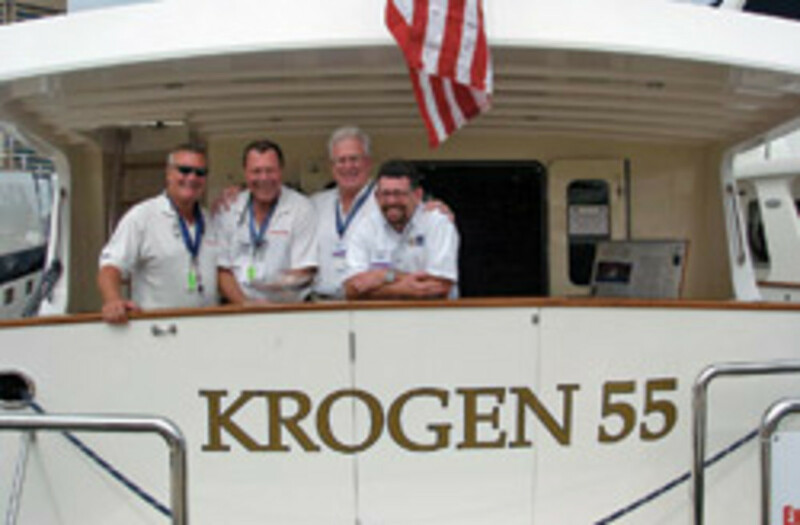 The PassageMaker People&apos;s Choice Award was presented to the Krogen 55 Expedition. The yacht features an open saloon and galley arrangement, with a Viking range, Jenn-Air refrigerator and Miele dishwasher. The next Trawler Fest will take place Jan. 27-29, 2011, at Bahia Mar Beach Resort & Yachting Center in Fort Lauderdale (www.passagemaker.com). PassageMaker University will precede the show Jan. 25-26. PassageMaker magazine and Soundings Trade Only are divisions of Dominion Enterprises, Norfolk, Va.
Regal Marine says the week of Aug. 28 through Sept. 3 was its best week for shipping boats since 2007. The company did not release specific numbers, but it reports a steady increase in retail sales and says dealers replenished inventory during the summer. "Everyone at Regal is excited and extremely grateful that we have had this exceptional week," Regal president and chief executive Duane Kuck says. "We feel that more dealers are recognizing the exceptional value proposition that partnering with Regal represents. We are proud of our products and have been aggressive with programs that help our dealers sell Regal boats." The company, which builds bowriders, cuddies, deckboats, express cruisers and sport yachts, had planned to end the Regal Prime Time Sales Event promotion but extended it through Oct. 31. The program offers rebates on Regal&apos;s entire line, which ranges from 19 to 53 feet, saving buyers as much as $50,000 on a new boat. Little Falls, Minn.-based Triumph Boats secured a nearly $2 million federal loan package through the USDA Rural Development loan program, says U.S. Sens. Al Franken and Amy Klobuchar, and Rep. Jim Oberstar. Local news reports say the public money is enabling production to start at a new plant built next to Triumph&apos;s sister company, Larson Boats. Larson officials say the new plant should initially create 20 jobs. The public loans helped pay for the costs of moving equipment from a closed Triumph facility in North Carolina. Production at the Little Falls facility is reportedly under way.